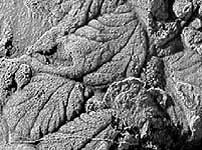 Rare fossil creatures from a rather mysterious period known as the Ediacaran are amongst the most exquisite examples of the earliest complex life. The 560-575 million-year-old specimens from Canada, of marine organisms called rangeomorphs, are preserved in three dimensions, as covered by a report in Science magazine. 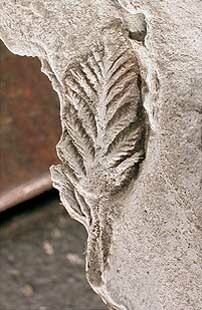 The organisms appear to be somewhat plant-like, with 'frondlets' - leafy structures that branch from stems. These were probably free-floating, elevated above the sea floor by a stalk. The organisms may have had an asexual, or vegetative, method of reproduction. Guy Narbonne, of Queen's University in Ontario, Canada, found the new assemblage of fossils in an area called Spaniard's Bay in eastern Newfoundland. The rocks at nearby Mistaken Point on the island have also yielded Ediacaran fossils, but these are squashed flat. At the time of reporting, Dr Narbonne believed that rangeomorphs were a single biological group, which could not fully be classified either as animals or as plants. The Ediacaran period occurs just before the 'Cambrian explosion', an evolutionary blossoming in which many important animal groups appeared for the first time. Professor Jim Ogg, secretary-general of the International Commission on Stratigraphy (ICS), had previously speculated that the mysterious Ediacaran organisms were probably 'torn to shreds' by the predatory animals that became more common in the Cambrian (see the earlier feature, The Tragic Life of the Ediacarans, via the sidebar, right). The soft-bodied rangeomorphs were probably buried in a mud-flow, which was itself then covered over by ash from a nearby volcano. In 1998, geologists accepted the Ediacaran into their official calendar of Earth history - the first new period to be added in one hundred and twenty years. The Ediacaran begins at the end of the last ice age of the 'Snowball Earth', or Cryogenian period, a term given to a series of glaciations that covered most of the planet between 850-630 or 600 million years ago. The global mean temperature would have been be about -50°C (-74°F) because most of the sun's (solar) radiation would have been reflected back to space by the icy surface. What caused the cycle of snowball earths? Possibly it was due to a lowering of atmospheric greenhouse gases to near-present levels through tectonically-mediated rock weathering, when the sun was considerably dimmer than present. One theory proposes that these climate shocks triggered the evolution of complex, multi-celled life.